Urban Moonshine Throat spray coats & moistens throat. Contains Sage and Spilanthes. 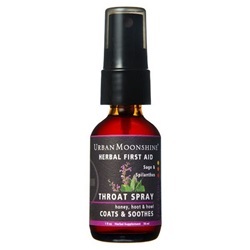 Urban Moonshine’s throat spray is a unique and pleasant formula designed to soothe and numb. The herbs we use support a healthy, relaxed throat and also provide a refreshing, gentle tingle.